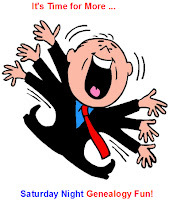 Saturday Night Genealogy Fun: Which Ancestor Do You Admire the Most? 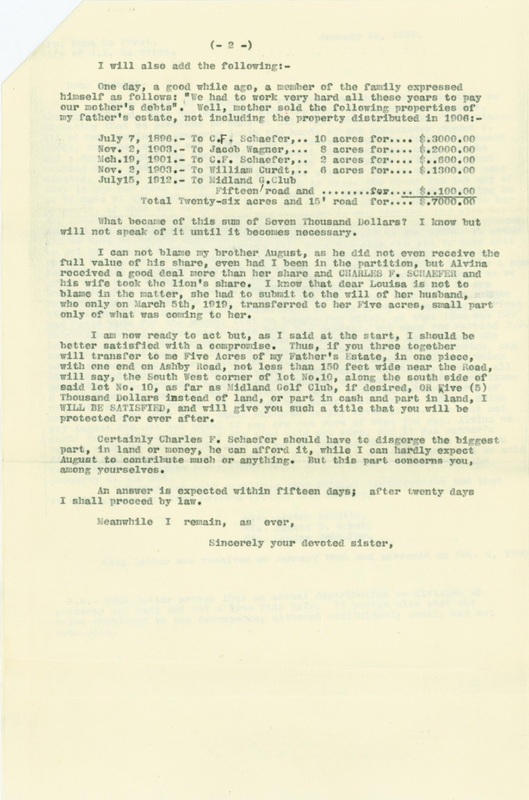 For Saturday Night Genealogy Fun this week, Randy Seaver is borrowing another question from the meme that surfaced a few weeks ago. (2) Please answer the fifteenth question: "Which ancestor do you admire the most?" I knew immediately who I wanted to write about, but this is frustrating, because I don't remember her name. The name is in a 560-page book about my Gauntt family, but I don't know where the book is in the house because half of my belongings are still in boxes due to an aborted out-of-state move nine years ago. But I remember her story. Most of my ancestry on my maternal grandmother's line is Quaker. 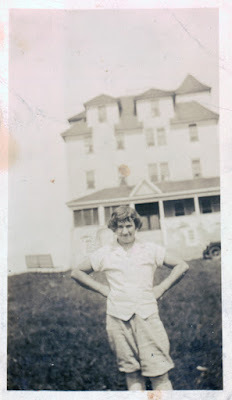 One umpty-umpth-great-grandmother who married into the Gauntt family was renowned in the Quaker community of New Jersey. She was known for giving inspiring testimony that lasted for hours. When she was older and could no longer stand, she instead prayed on her knees for hours. And people stayed to listen. How can you not admire someone like that? I found her name! I was moving some reams of paper tonight and discovered the book beneath them. "Ann Ridgway was a well known Quaker minister of Little Egg Harbor, N.J. She began preaching when she was a very young girl and traveled extensively on preaching excursions from that time until a very advanced age. She was a minister for over 60 years . . . . When very old, she could not stand to preach, but would kneel while preaching for an hour or more." Sometimes real life has an annoying way of intruding on volunteer activities. That's what happened to me earlier this year, and it's why issues of ZichronNote and The Baobab Tree did not appear in the spring, as they should have. But I've been dancing as fast as I can, and I managed to catch up. Both journals have recently been published as double issues, with more pages and stories than usual in an effort to atone for the delay. 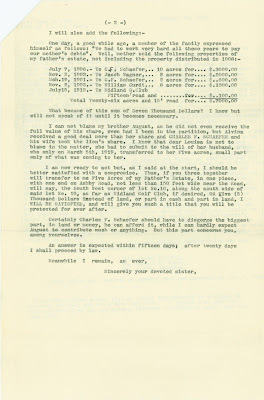 In the February/May 2017 issue of ZichronNote (from the San Francisco Bay Area Jewish Genealogical Society), Fred Hertz wrote about his successful efforts to contact cousins from other branches of his family tree and his thoughts on the different paths family members took. Martin Gewing was fortunate to see a torah from the town his mother's ancestors lived in. Judy Vasos shared a special photograph from World War II, of an entire wedding party in Germany wearing the required yellow stars of David, and shared her discovery of a second photo from that day. Alan Silverman related one Sephardic family's journey, over several generations, from Spanish expulsion to Dutch sanctuary to British establishment. In the third article in a series, Kevin Alan Brook described documentation proving that Sephardic Jews resided in central and northern Poland. Sheri Fenley, the Educated Genealogist, graciously allowed us to reprint her story (with new material!) about David Nathan Walter, an early Jewish pioneer in San Francisco. 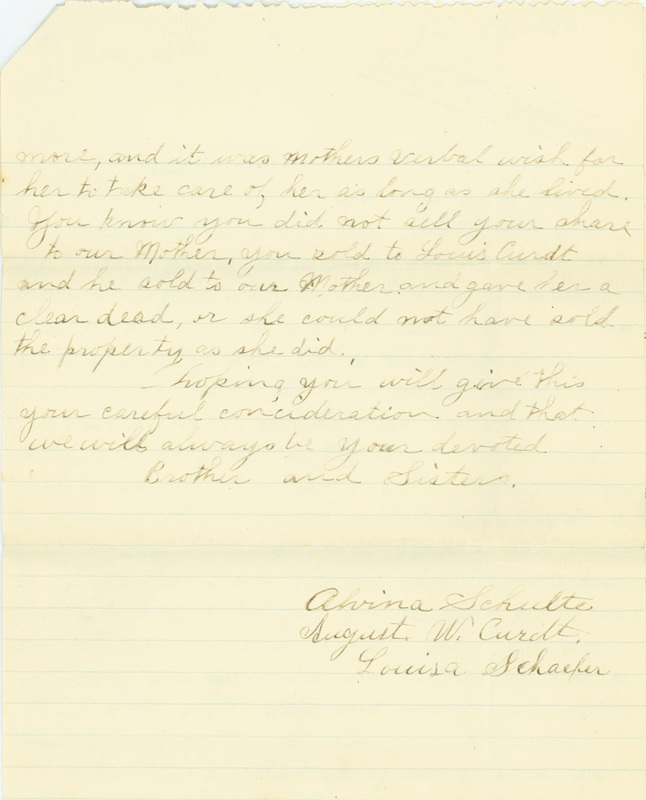 One of our members wrote about her pleasant surprise at discovering that her 10-year-old grandniece is actually interested in family history. And the SFBAJGS Treasurer, Jeff Lewy, went over the society's financial performance in 2016 and explained how we were able to help several genealogy projects around the world. The Winter/Spring 2017 issue of The Baobab Tree (published by the African American Genealogical Society of Northern California) led off with an article by Patricia Bayonne-Johnson about the Georgetown Memory Project, which grew out of the public revelation that Georgetown University survived an early financial crisis through the sale of slaves. This article is a follow-up to one Pat wrote in 2008, also published in Baobab, about her family members that were among the Georgetown slaves. Veola Wortham contributed her hard-learned lesson not to take everything family members tell you as gospel. In the first half of a two-part article, Ellen Fernandez-Sacco discussed her discovery that her early ancestors in Puerto Rico owned slaves and how her research has changed due to learning that. Richard Rands eloquently explained why your family tree should be on your computer at home, not online. Janis Minor Forté didn't let one adverse piece of information define the legacy of her grand-uncle. In addition to her first article, Veola Wortham also reviewed the book Black Indian Slave Narratives and discussed its relevance to genealogical research. There is also a review by Sharon Styles of this year's Sacramento African American Family History Seminar, where the keynote speaker was Paula Madison. That sounds like a lot of interesting genealogical reading, doesn't it? Wouldn't you love to see how those stories turned out? All you have to do is be a member of the respective societies, and you can happily receive issues of the journals. Visit the San Francisco Bay Area Jewish Genealogical Society (for ZichronNote) and the African American Genealogical Society of Northern California (for The Baobab Tree) for membership information, and all your problems will be solved. Well, at least those relating to being able to read the journals. Another way to obtain a copy of either journal in the future is to have a story published in it. (In fact, for Baobab, you will receive five copies!) You do not need to be a member to submit a story. Have you had a breakthrough in your research, solved a family mystery, discovered a different way to use resource materials, or walked where your ancestors walked? Do you have an interesting story about your family? Other people would love to read about it! Submission guidelines for The Baobab Tree (including deadlines) are online, or you can send me a message regarding a submission to ZichronNote. Let's talk about it! This is a calling card that is 3 3/4" x 2 1/4". It is made of fairly heavy card stock. It is yellowish-brown and has some staining or discoloration in the lower left corner (which doesn't show up when I look at the card itself). It also has holes that appear to be from two straight pins that were stuck through it (although I don't think it had pins in it when I received it). 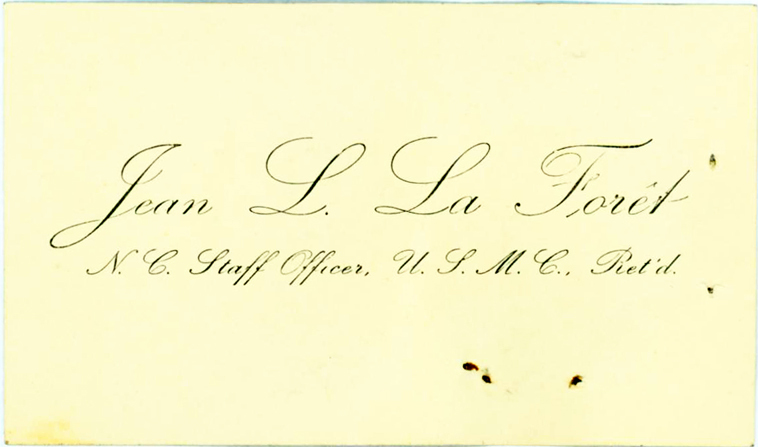 A newspaper clipping has been pasted on the back of the card, and that side has some handwriting. The calling card is for Jean La Forêt, apparently from the same printing as the one I posted two months ago. 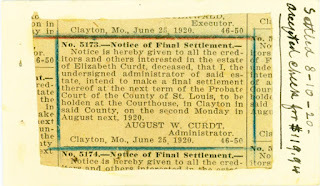 That card had the June 25, 1920 "Notice of Final Settlement" pasted over the front of the card This time we can see the front of the card. That dollar amount has come up before also. 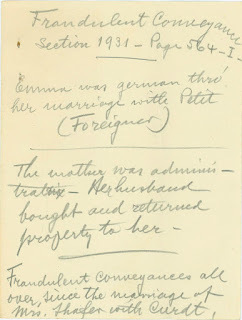 It appeared in Jean's notes on the breakdown of Elizabeth Curdt's estate, with his comment that it should have been $133.35. It's the amount that Emma, Elizabeth's daughter, accepted as her portion of her mother's estate. This piece of newsprint is 5" x 7 1/8". It has been torn out and has rough edges on three sides. The right side appears to be the edge of a newspaper page. 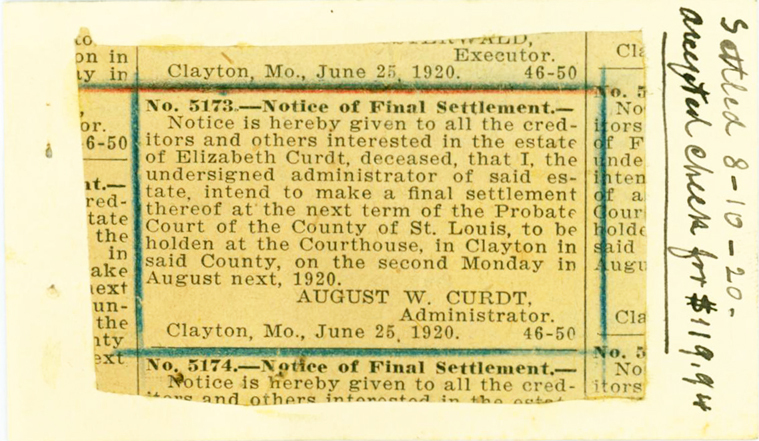 The section that was saved is the "Probate Court Docket", with Tuesday, August 10, 1920 as the first date listed. Underlined in blue pencil is Estate "5173 Curdt, Elizabeth", with "Aug W Curdt" under "Admrs. and Extrs." (Administrators and Executors). 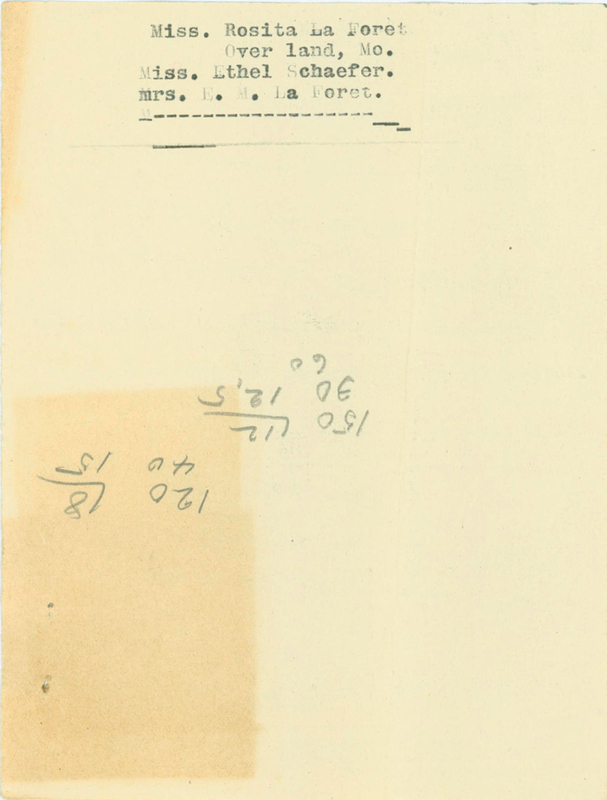 It was folded down the first column, maybe to fit in an envelope, but that doesn't appear to show up in the scan. 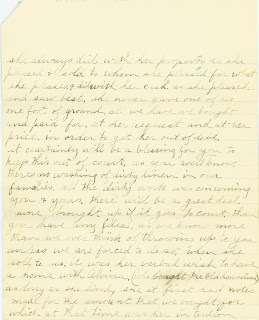 The August 10 date matches what Jean wrote on this card, on the card posted earlier, and in his notes on the estate. While the $119.94 amount matches that on Jean's notes, it does not match what he wrote on the first card, which was 119 98/00. So there's a difference of 4 cents for some reason. I'm leaning toward the $119.94 figure being what Emma actually accepted, since that's in Jean's breakdown, but there's no way to tell for sure just from these items. None of these clippings has any note saying from which newspaper it came. The announcement of Elizabeth Curdt's death was said to be in the St. Louis Daily Globe-Democrat, so maybe these were published there also. And sometimes I'm really slow, but I figured out tonight what the N. C. probably stands for on Jean's calling card: "Non Commissioned." It took a while to sink in because I've never seen it abbreviated in that way. But Jean was a noncommissioned officer (NCO) in the Marines, so it makes sense. These two items were next to each other in the original pile of papers I received. I kept them together because they both have the "Notice of Final Settlement." (1) Sunday, 18 June, is Father's Day. 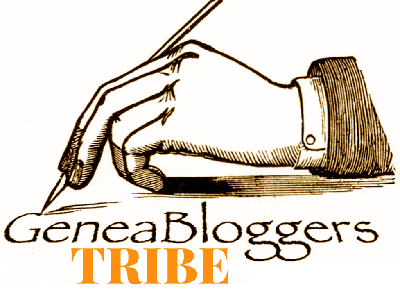 Let's celebrate by writing a blog post about your father or another significant male ancestor (e.g., a grandfather). (2) What are three things about your father (or significant male ancestor) that you vividly remember about him? 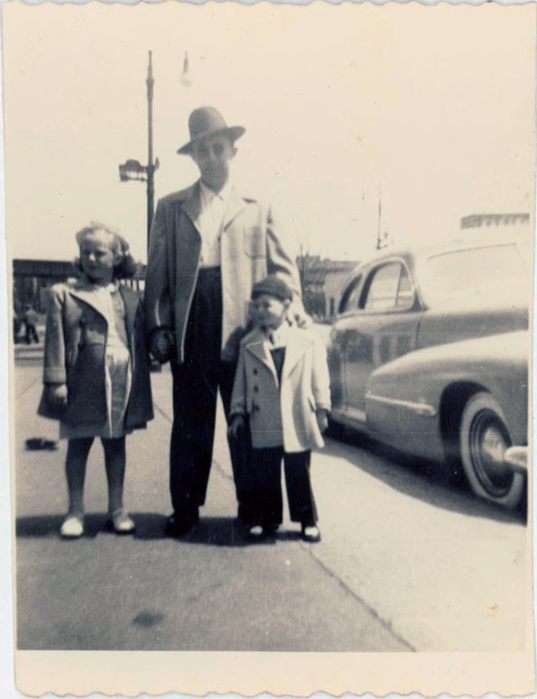 I decided to write about my paternal grandfather. • One of the first things I always remember about my grandfather is his prosthesis and amputated leg. He never talked about the accident that caused him to lose his leg (we finally learned details several years after he died), but he let us kids play with the prosthesis when he visited us in California. 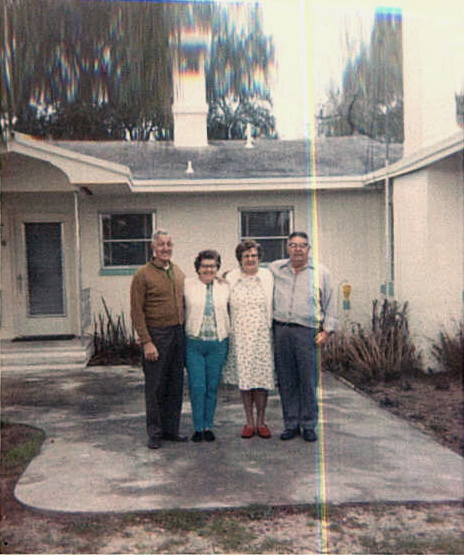 After my family moved to where my grandfather lived in Florida, it became a regular part of the routine that every now and then Grampa had to see his doctor to have the prosthesis adjusted. And one great adventure with my mother driving happened when we were going to Pensacola with Grampa to see his leg doctor. • Another vivid memory is my grandfather's stamp shop in Niceville, Florida. It was attached to his house, so anytime we visited, we usually stopped in the store also. And I worked for Grampa in the shop, so I spent extra time there. Sellers Stamp Shop was a homey little operation. The front part was the retail area, which had glass display cases for coins, postage stamps (for philately, not for mailing), and associated paraphernalia. He sold some other odds and ends also. The rear of the shop was where we made rubber stamps, such as "PAID" and address stamps, with "hot lead" by hand. (Nowadays it's all done with computers. Feh.) Working at the shop was my first job after babysitting, so I was very proud of the work I did. And I got to hang out with Grampa! These four sheets of lined paper measure 7 13/16" x 9 13/16". They appear to be inexpensive and of low quality, with no watermark. Although the paper is lined on both sides, the writing is on only one side of each page. Unlike so many items in this collection that have been glued together, these pages are attached by an ingenious metal brad. The pages have three fold lines; it looks as though they were folded in thirds to fit into a business-sized envelope, and then one end was folded over to fit into a shorter envelope. 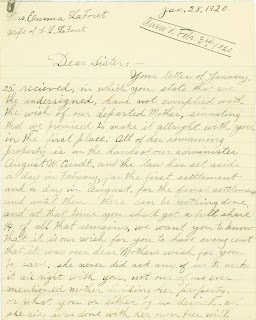 This is a four-page letter, all handwritten, dated January 28, 1920. 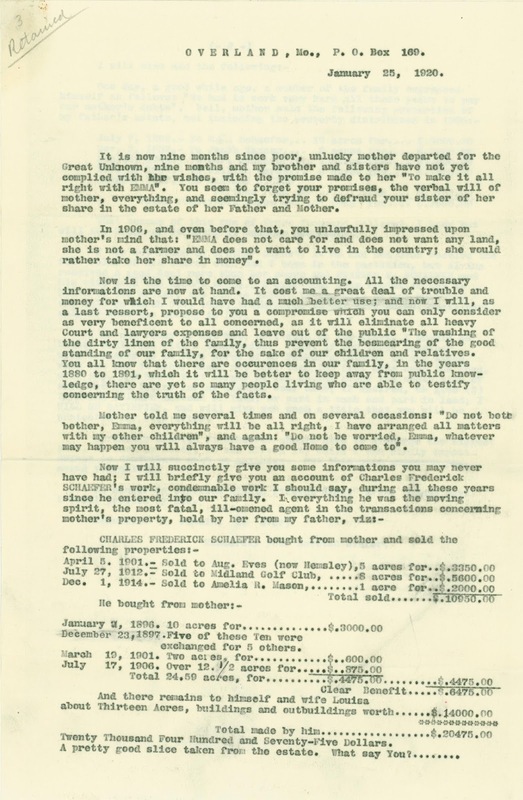 It is from Emma (Schafer) La Forêt's three siblings — Alvina (Curdt) Schulte, August W. Curdt, and Louisa (Curdt) Schaefer — and was written to Emma in response to the letter dated January 25, 1920 that she sent to them (which I posted last week). If you don't want to read the handwriting, don't worry — look at this. Yes, conveniently, I also have a typed transcription of the letter. It is not exact — several capital letters were made lower case, a few letters went the opposite direction, spelling was changed, ampersands were converted to spelled words, and punctuation (which is very casual in the original) was adjusted. In addition, two entire phrases were omitted. But it's a little easier to read than the handwriting. 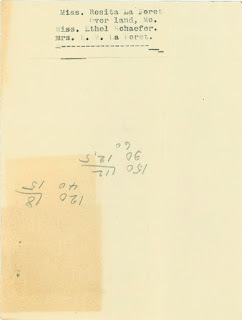 This particular page is 20# watermarked bond (BERKSHIRE SOUVENIR BOND USA), 8 1/2" x 13", and cream in color. If that sounds familiar, it should. 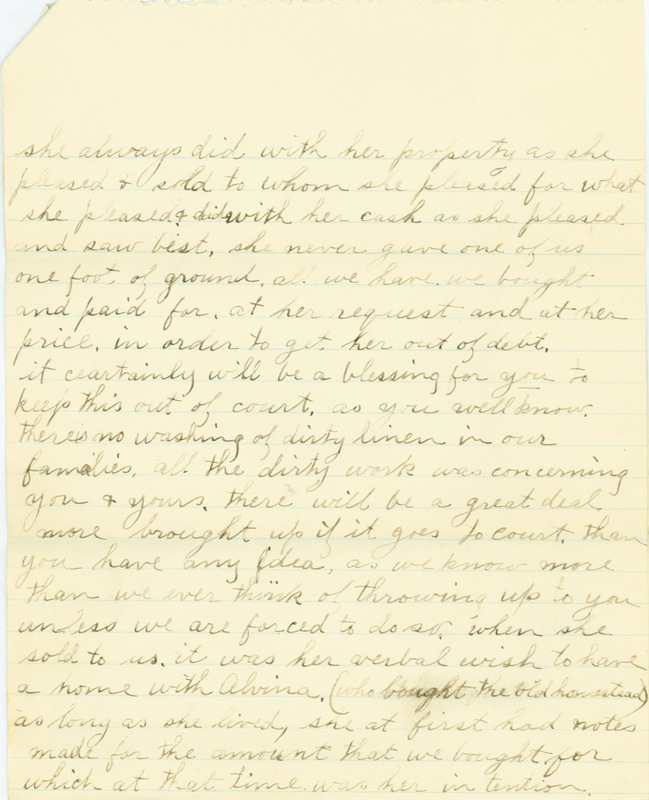 It's the same type of paper as used in the typed copy of Emma's letter to her siblings. In fact, this is attached to those two pages. 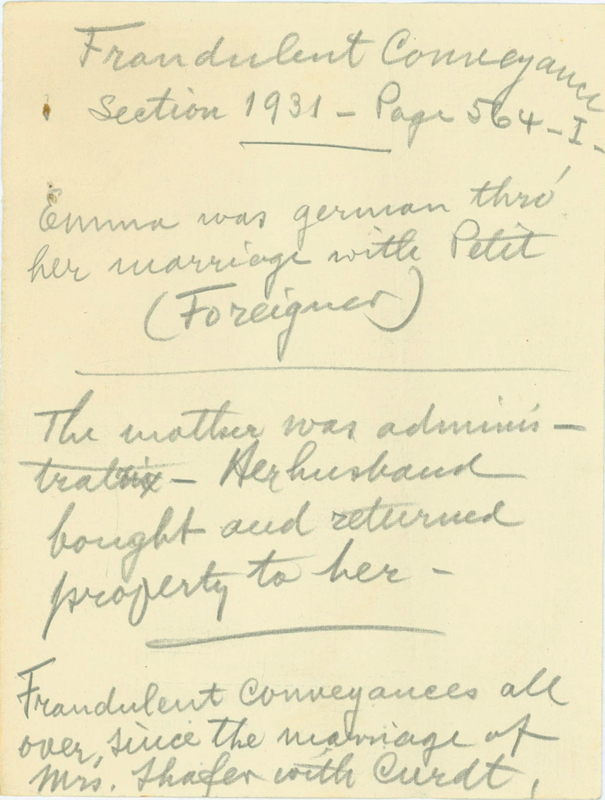 The second page of the original begins with "she always did with her property as she pleased & sold to whom she pleased for what she pleased & did with her cash as she pleased and saw best". The transcription omitted "& sold to whom she pleased for what she pleased". 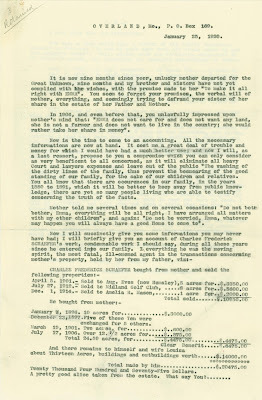 About halfway down the third handwritten page is "C. F. Schaefer bought several pieces of ground at different times, & sold them at a good profit, but he bought and paid the prices Mother asked for them, you say there was ($7,000.00) severn thousand dollars worth of property sold". The transcription left out "at a good profit, but he bought and paid the prices Mother asked for them". 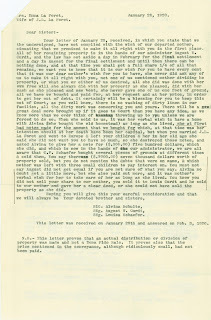 In addition, the transcribed letter has two notes at the bottom not from the original: when it was received and answered, and a comment that the letter proves distribution of property was accomplished, not a sale. 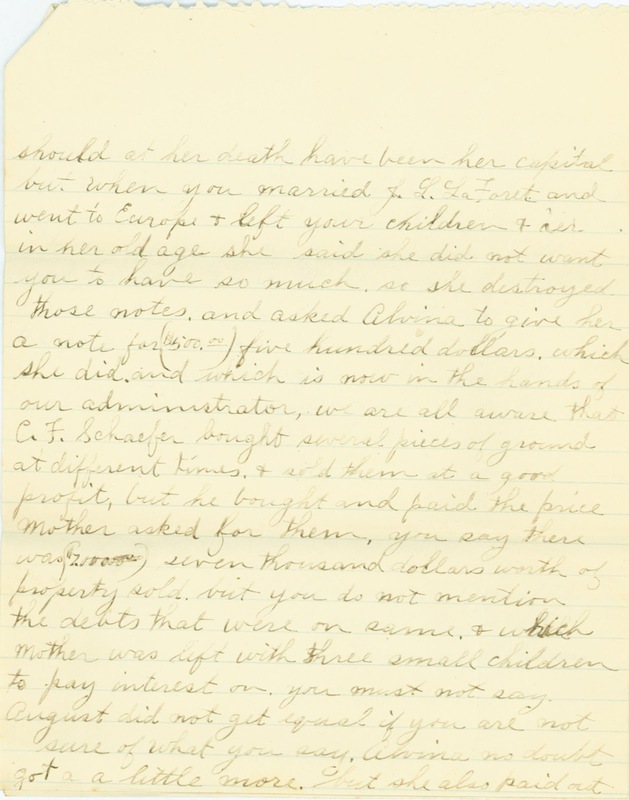 "when you married J. L. La Foret and went to Europe & left your children & her in her old age"
"but you do not mention the debts that were on same, & which Mother was left with three small children to pay interest on"
I admit, I have wondered why Emma did not bring her children from her first marriage with her when she married Jean La Forêt and went to Europe. But the siblings' accusations do not ring true. 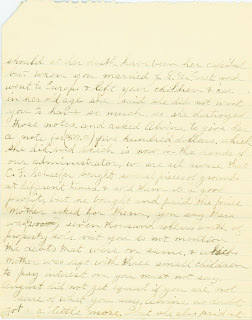 First of all, when Emma left Missouri to marry Jean in 1908, the children were not that small. Camilla Petit was born in 1894, making her 14, and Eugene in 1896, making him 12. Marie was the oldest. Emma did not give her birth date on any documents I have, but Jean wrote in his diary that she was born in 1885. So she was an adult in 1908. In fact, she apparently was married that year, because I found Marie in the 1910 census, married to William Schulte (as Emma stated in her narrative). The census says that they had been married for two years. And Camilla and Eugene are living with them, not with their grandmother. (As an aside, the census shows that Marie was born in Germany; given how friendly Emma's in-laws were toward her, I'm sure that they were even more excited to have a baby in the house.) 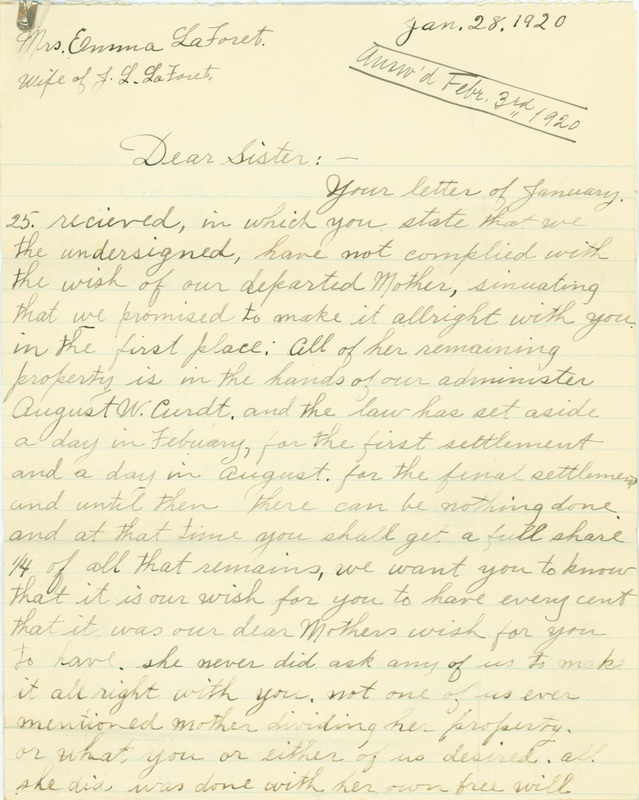 While I have no documents that indicate how long Camilla and Eugene had been living with their older sister, it is not unreasonable to think they had been doing so since Emma had departed. Once I call the complaint about Emma dumping her children on her mother into question, the siblings don't have much ammunition left. So even though they wrote that Emma was the person who should dread the family's dirty linen being aired in court, I'm still inclined to think that the siblings were probably in the wrong and deliberately deprived Emma of at least some of her rightful inheritance. 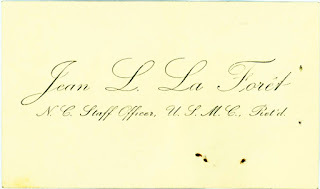 Both the original letter from the Curdt siblings and the three glued-together typed pages with the transcriptions were in this envelope. 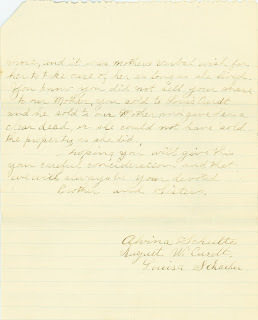 One of the copies of the waiver signed by Louis Curdt was in it also. 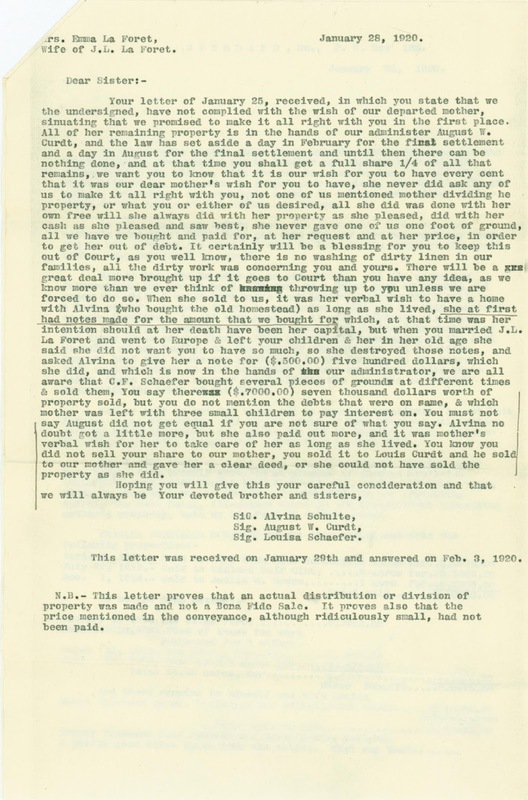 What was not in it was a copy of the response to the Curdt siblings letter dated January 28, which was sent on February 3, according to the note at the bottom of the transcription. Recently two different influences on my blog came together in a way that made me write this post. Randy Seaver's Saturday Night Genealogy Fun theme had people writing about homes in which they have lived and which ancestor moved the furthest during his lifetime. And the California Genealogical Society invited Craig Siulinksi to teach a class about writing one's life, in which he suggested that attendees each write about a significant event in our lives. Having those ideas running around together in my head made me focus on a significant move. As evidenced by the post about the homes in which I've lived, I have moved many times in my life. 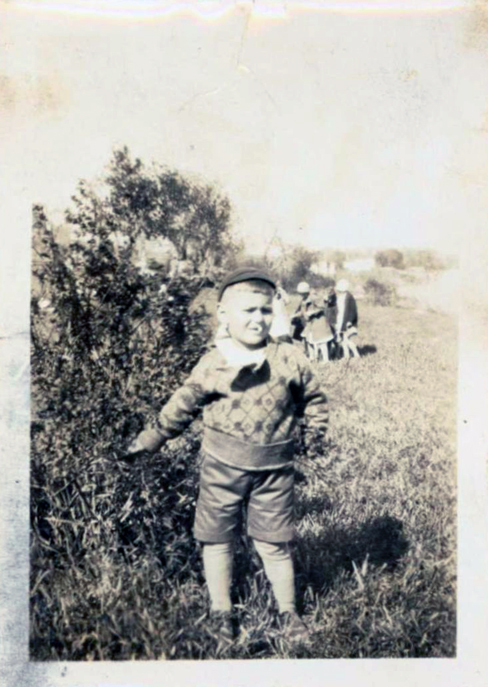 My family moved so many times when I was a kid, my mother was nicknamed "the wandering Jew." One of the most significant moves came early in my life, when my family left the United States and lived in Australia for two years. We did this through a potential immigrant program sponsored by the Australian government. I don't know how many groups might have been targeted, but the relevant one for my family was tradesmen. My father was a talented and accomplished mechanic and apparently fit in well with what the government was looking for. 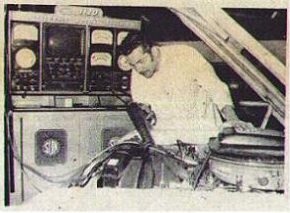 He was such a good mechanic, his photo was used in a newspaper ad in Australia! I don't remember any of the preparations leading up to the move, because I was just eight years old and my parents handled all of that. My father has told me one thing he had to do was go to San Francisco for an in-person interview at the consulate. His opinion was that they wanted to make sure he was white; I don't know if that's valid or not. We flew to Australia in March 1971. The first leg of our journey was taking a helicopter from Ontario Airport in far western San Bernardino County to LAX, where we would catch a plane. The three of us children were thrilled that we could look out the windows of the helicopter in all directions, but my mother, who was pathologically afraid of heights, had her eyes squeezed tightly shut the entire trip. She kept telling us she didn't want to hear about what we could see down on the ground. 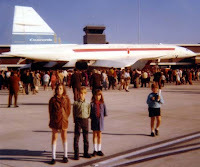 The airplane we flew on was a Pan Am Boeing 747. Those were relatively new at the time, and I think it was pretty fancy, but I can't recall anything specific about the flight other than that we had to stop in Hawaii to refuel (which nowadays sounds amusing to most people). And illogical as it seems, my mother loved to fly, as long as she was not sitting by the window. I have only vague memories of our earliest times in Australia. The first place we lived was an apartment. I think that's where we were when my parents bet each other who could stop smoking longer. Some background: Both of my parents had smoked my entire life. My mother's best friend smoked also. When we were younger and my mother asked us children what we wanted for Christmas, we would say in a chorus, "We want you and Daddy to quit smoking." To which my mother would reply, "Yeah, right, what do you really want?" Well, be careful what you wish for. Next we lived in Maroubra Junction. The main thing I remember about this location is that my mother worked at a Greek deli for Mr. Kringas. One time when I was there Mr. Kringas asked if I could read. At 9 or 10 years old, I proudly said I could, and he promptly handed me a newspaper — but it was in Greek! He thought this was a great joke, but maybe that's what motivated me to learn the Greek alphabet. Even while he's busy posting about Genealogy Jamboree, Randy Seaver found time to come up with a new challenge for Saturday Night Genealogy Fun! (1) Do you have photos of all of your ancestors back to the 1850 time frame? Which recent ancestors do you not have a photograph of? (2) Review your files, and list the ancestors for whom you want and/or need to find a photograph. Also list where they resided and where they died. Where would you look to find a photograph of them? (3) Share your answers on your own blog post (and leave a comment here with a link), or on Facebook or other social media. 1. I have photographs of my parents, all four grandparents, and eight of nine great-grandparents, counting my paternal grandfather's adoptive father. 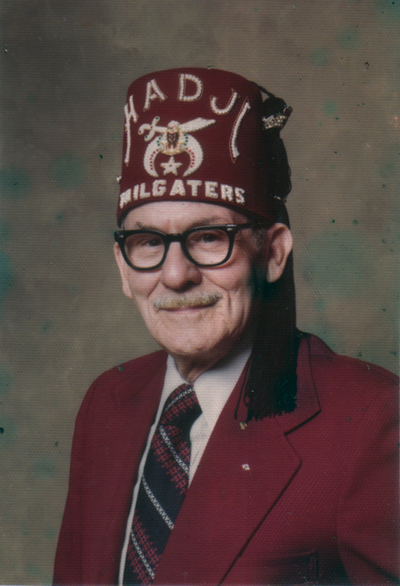 As I have not yet identified my grandfather's biological father, it would be surprising if I had a photo of him. Of my sixteeen great-great-grandparents (eighteen if I count the unidentified great-grandfather), I have photos of only ten. My great-grandmother Jane Dunstan had a brother, Frederick, who also immigrated to the United States. I could try to track down his descendants to see if any of them have photos of the parents. I also know of some cousins on a collateral line of that family who are still in England. They would be another possible resource. I am in touch with several Gauntt cousins. I'm sure that at least one of them has a photo of Amelia, right? Cornelius Sellers is a tough one. He died young and his widow remarried. Cornelius' only surviving child died young also (before his mother), but one son survived from the widow's second marriage. Perhaps someone on that side of the family might have a photo of Cornelius. Another possibility is through his Civil War service. I doubt any photograpohs of Simcha and Baila Meckler ever existed. The only person I know of to ask is my cousin in Israel. Unfortunately, other than Cornelius, it is unlikely that these great-great-grandparents appear in any archival collections, but one should always check, just to make sure. Treasure Chest Thursday: Elizabeth Curdt's "Obituary"
This is three newspaper clippings that have been glued together. The first piece is at the top, with the name of the newspaper and the apparent date of the articles. It is 3 1/8" x 3/4". The second piece is the long, main piece of this amalgamation. It is a short article about Elizabeth Curdt's death from burns suffered two days earlier and a second article (a short piece about "Pershing's Own Band" giving performances) that is partially obscured by the third clipping. It is 2 1/8" x 7 1/8". 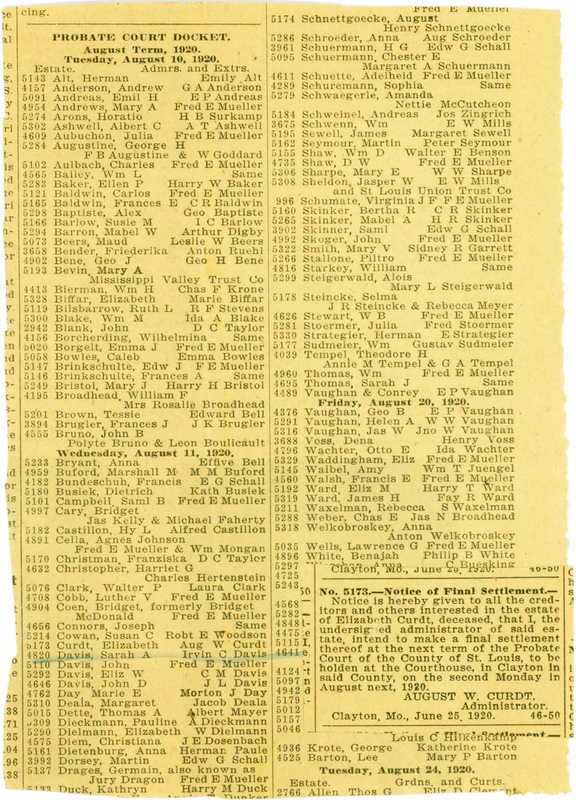 The third piece has been pasted in the middle of the long piece, just below the report of Elizabeth's death, and is a standard death and funeral notice. It is 2 1/8" x 1 3/16". In addition to the three pieces having been clipped from the newspaper and then taped together, the other modification that has occurred to the long piece is handwriting in blue pencil at the bottom reiterating the date and time of Elizabeth's death. It is possible that the only reason the second article was kept with the one about Elizabeth's death was to be a platform for the death notice and note. This came to me assembled already, so I can't confirm from my own knowledge that these all came from the same newspaper, but for the sake of analysis today I will work from that presumption. The St. Louis Daily Globe-Democrat reported on Sunday, April 27, 1919, in its morning edition on the death of Mrs. Elizabeth Curdt the previous Friday, April 25. On the same day, the newspaper included a standard death notice and funeral notice, with the funeral scheduled to take place the next day, Monday, April 28. The piece of information that immediately jumped out at me from this is that Alvina was at the house, apparently by her own admission, when her mother died, and just couldn't get to her in time. If you believe the theory that Elizabeth was murdered is a viable one, then that definitely sounds suspicious and casts Alvina in a bad light. In addition, Alvina seems to have been the child who inherited the largest amount directly after Elizabeth's death (her sister's husband having apparently obtained most of his money through purchases and sales of land prior to their mother's death). On the other hand, the coroner's jury gave a verdict of accidental death. I'll have to order that file, if it still exists, to see if testimony is included. I wonder if anyone commented on Alvina's presence . . . . The article about Elizabeth's death lists only her three children who had been residing in Missouri their entire lives. 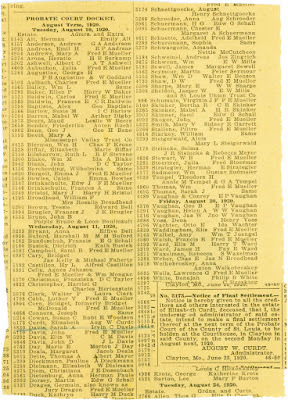 The death notice added Emma, who had returned from Europe in 1917, less than two years previous to these events. It's possible that the information for the two were given and/or compiled by different people. The handwriting at the bottom looks like that of Jean La Forêt to me. I can't think of a reason for him (or anyone, for that matter) to have copied the date and time. Maybe his eyesight was starting to fail and he wanted to be able to read it more easily?